Three princes who would all have me. One as a means to peace, one as means to power, and the other?the other to set me free.? For seven years the Babylonian princess Tiamat has kept her family?s secret, waiting for her father, the mad king Nebuchadnezzar, to return to his family and his kingdom. Married for treaty at fourteen and widowed at twenty-one, she revels in her newfound independence, determined to control her own destiny. But when a nobleman is found dead in the palace, Tia must discover who is responsible for the murder, even if her own freedom is threatened. Evidence points to the man-beast roaming the Gardens, and Tia fears the closely-guarded secret may soon be discovered. But the lies have only begun to unravel, and as Tia uncovers one unspeakable truth after another, she finds that she is the centre of the intrigue, and her questions are a threat to her very life. Madness, sorcery and sinister plots mingle like an alchemist?s deadly potion, and Tia must dare to risk everything ? to save the kingdom and herself. Every time I hear that an author has published another novel or is in the works to produce one, my excitement mounts. Tracy Higley’s writings have continued to excel with each story that unfolds. Here, in the Garden of Madness, readers will find themselves getting lost in history. This is a history that actually occurred though most of the story is fictional and based on imagination. The historical part is based on the writings of Daniel in the Old Testament as well as other sources used by the author. Due to the current world situation and actual location of Babylon, the writer couldn’t travel to that area; however, her story takes intrigue and mystery to new heights in this setting. Nebuchadnezzar was a Babylonian king who raided Jerusalem three times, each time taking captives back with him, until the final time when Jerusalem was left in ruins. Daniel was taken with the first wave of captives, and Ezekiel was taken later. Jeremiah was even a prophet during this time though he wasn’t located in Babylon. Some scholars believe he may have been in Egypt. Regardless, the characters in this novel are of both non-fictional and fictional backgrounds. During one period of this particular king’s reign, he was foretold that unless he acknowledged the one true God, forsaking all other gods, he would be removed from his throne for a time. Then, when he looked up, he would regain his sanity. The gardens in this story are well-described and central in some ways to the story’s plot. As the pages turn we learn that there is a very deep and devious plot being planned for the benefit of one who seeks the power of darkness. Tia is portrayed as a princess, but is she really? She feels that there are many lies being told and sets out to discover the truth. What she finds and gets entangled in will keep many turning pages until the end of the novel. The queen and many others are hiding the king’s true illness, but where is he and who knows what is going on? Within the palace there are murders, lies, anger, threats of harm and more. Tia seeks true answers, but what she finds and whom she finds changes her future in ways she couldn’t ever conceive. Tia is a rebellious princess, but one with courage to really know the truth no matter the cost. What is the cost she will have to pay if she wants to fulfill her heart’s desire, to change the world? During all of this, she meets one of the Jewish princes and longs to know more about their God, but something keeps getting in the way of her finding out. Will her father, the king, ever be the man she once knew? How can the plot and those involved be found out and stopped? Who should Tia trust? Who shouldn’t she trust? Garden of Madness is a 5-star plus novel from beginning to end! So strap yourself in and hold on for the ride you never see coming! 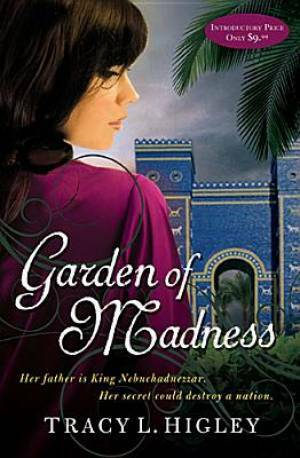 Garden of Madness is the story of the Babylonian princess Tiamat, daughter of King Nebuchadnezzar. The king has been struck with madness and for seven years has secretly roamed the Hanging Gardens like an animal. All seems secure for the royal family until the unthinkable happens. When a palace noble is found brutally murdered and the king’s safety is threatened, Tia begins a quest for answers and discovers truths she never could have imagined. With the help of two Jewish captives, the wise man Daniel and Pedaiah, the brother of her late husband, Tia enters a world of palace intrigues and closely guarded secrets to protect the king she loves. Right from the get-go I was drawn into this story. The mystery and secrets swirling around the palace kept me guessing throughout the entire book and once I thought I had it all figured out, the author would throw another twist. Tia was a wonderful character to read. She is flawed and I liked that about her. At times I wanted to shake some sense into her and then later I was smiling with her or cheering her on. I thought the romance in this story was very well written. It wasn’t overdone and the relationship builds, believably, over time. This book had darker elements than the previous books in the series but I thought the author did a good job of portraying the heaviness of these situations without overdoing it. So far this has been my favorite read from this author and I would absolutely recommend it!